This is one of the plants that we bought from Campanule & Compagnie, a specialist perennial nursery in the nearby village of Champagnac-le-Vieux. 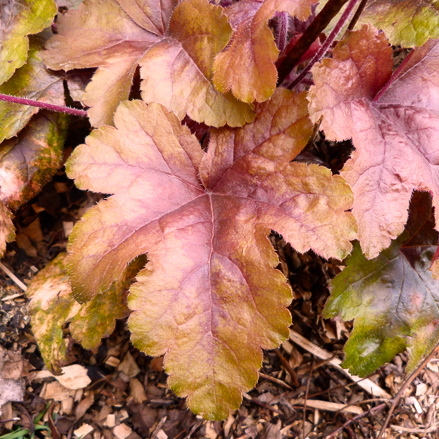 It’s called a Heucherella, which doesn’t exactly trip off the tongue. I chose it because of the beautiful coppery-coloured foliage, although it does have little white flowers on spikes too. 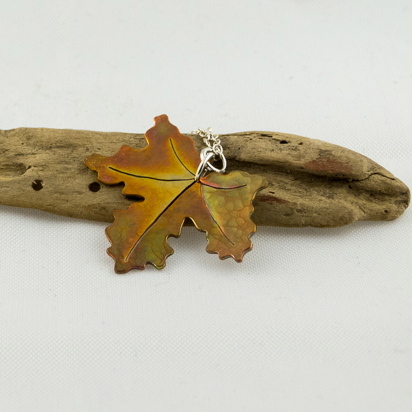 I wanted to capture both the shape and colour of the leaves in a pendant. The choice of copper was easy to make, but the flat, slightly pinky colour of the newly-polished metal wasn’t quite right in this case. I decided to experiment with oxidising the cut out leaf shape, not using eggs this time, but the heat from my blow torch. This is a slightly unnerving process, as you can’t really control how the metal will react to the flame, and you can end up melting the surface. The copper and bronze tones turned out really well, and I’m pleased with the way the colour varies across the surface, just as it does on the real leaf. I don’t usually seal my copper jewellery, but this one has been given a coat of lacquer to protect the finish. The pendant includes a silver chain, and is available now from my Etsy shop.